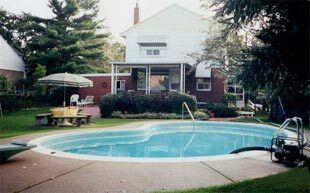 Reaman Pool Fill-Ins Ltd. - The Swimming Pool Fill-In Specialists, specializes in swimming pool fill-ins, and is a leading company in its field. We operate out of Markham Ontario Canada and our services extend to Whitby, Scarborough, Downtown Toronto, Etobicoke, Newmarket and many other locations. We have demolished and filled in over 500 pools throughout the Greater Toronto Area. Place your mouse over the picture to see it change. The materials that we use along with our refined process allows us to give a five year guarantee against sinkage or settling. We are the pioneers of swimming pool fill-ins and the first and possibly even the only company to offer a five year guarantee.